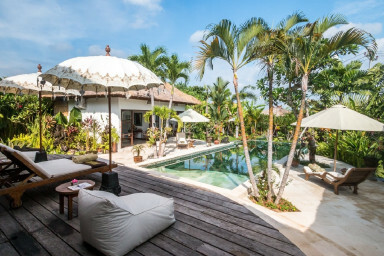 Located in the rural area of Canggu where authentic Bali farmers are still working in their fields, Villa Tibu Indah is a beautiful 3 bedrooms’ villa with compound style where each bedroom are a stand-alone pavilion enclosing the 12 meters private swimming pool. From wood-deck sunbeds area connected to indoor/outdoor small alfresco bar, the villa also featured a message’s bale where you can pamper yourself without the needs of stepping outside. A team of dedicated staff will also make sure your comfort is well-maintained throughout your stay.